During the Spring Semester, three different tracks – Thematic Focus, Clinical Work or Academic Research – allow students to pursue their particular interests. Allocation of places in the different tracks is based on a competitive selection process. Students who want to deepen, broaden and diversify their knowledge in particular thematic areas by attending two seminars during the Spring Semester. Organized around small and intimate learning communities, they allow selected students to address topical issues with leading experts and practitioners. The role and engagement of civil society in transitional justice are ever-developing, with practices and lessons learned over time confirming the essential role that civil society actors play in prompting, engaging in and ensuring the sustainability of transitional justice processes. This course takes a primarily practice-based approach to the subject and will be of importance and value to those from a civil society background, those wishing to work within civil society organizations and those with an interest in the transformative potential of civil society actors. The course will begin with examination of civil society as a transitional justice actor, providing a broad base for in-depth consideration of further issues; it will explore three particular modalities of action in detail (monitoring and documentation of human rights violations; engaging with supra-national mechanisms; and strategic litigation); and will conclude with an assessment of project cycle management, an increasingly vital aspect of the functioning of NGOs today. With a particular focus on contemporary military operations, this course aims to investigate international humanitarian law rules regulating the conduct of hostilities. Rather than studying individual rules in the abstract or in isolation, they are discussed by analyzing a series of challenges that arise during contemporary military operations, for example, drones, urban warfare or human shields. The course considers both theoretical and practical difficulties. The overall aim is to provide students with an in-depth understanding of the rules governing the conduct of hostilities and the skills to understand and argue for their application in a particular situation, with an adapted knowledge of the armed forces’ organization. This course introduces students to the Islamic law of armed conflict and how it relates to the current conflicts in Muslim contexts. It examines the rules regulating the use of force during both international and non-international armed conflicts under classical Islamic law. Classical Islamic rules providing protection to certain persons and objects and those regulating certain means and methods of warfare are examined in order to find out, first, the impact/challenges surrounding their application in current armed conflict situations and, second, their compatibility with international humanitarian law rules. The course also discusses the distinction between the use of legitimate force and terrorism (both domestic and international) under Islamic law. It analyses the development of the classical Islamic public international law framework and its impact on the issues of the Islamic jus ad bellum and the jurisdiction of Islamic law. The course starts with identifying and defining the Islamic law key concepts, sources, and schools in order to familiarize the students with such a complex and highly technical legal system and understand the extent of its contemporary application. What is ‘the rule of law’ and why is it considered important for economic and democratic development? How has rule of law development assistance evolved over the last half-century and what are its antecedents? How are rule of law programmes designed, what are their typical components, and how is their impact measured? This course considers rule of law work from the perspective of the practitioner, using case studies, procurement documents and project reports to help students understand how rule of law projects are developed and implemented in the field. The course also considers scholarly critiques of rule of law assistance, allowing students to evaluate the operational features of such assistance within a broader analytical framework. Clinical Work, in the form of research internships or participation in a moot court, provides a solid exposure to practical work and situations. Research internships with leading actors like the United Nations Relief and Works Agency for Palestine Refugees in the Near East (UNRWA), the Federal Department of Foreign Affairs' Task Force for Dealing with the Past or the International Center for Transitional Justice (ICTJ) allow selected students to acquire first-hand professional experience and put in practice what they learn in class. Students are accompanied during the entire duration of their research internships via seminars that provide peer-to-peer support and exchange of ideas. 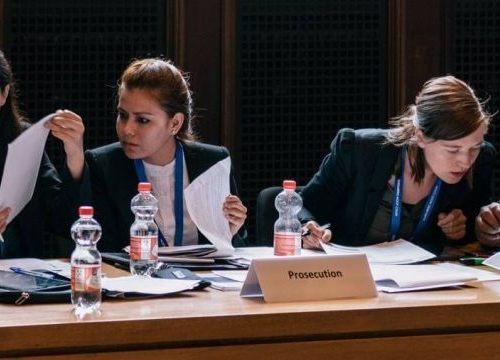 Via their participation in the Nuremberg Moot Court selected students get exposure to concrete cases, plead on topical transitional justice issues and have the opportunity to meet other students from all around the world, as well as experts and practitioners. The Nuremberg Moot Court is one of the leading moot court in international criminal justice. Teams from around the world present their legal briefs before a panel of judges, comprised of world-renowned experts. Each team presents either as the prosecution or the defence and is evaluated for the content of its briefs as well as its presentation skills, teamwork and team spirit.  For its first participation in 2017, the Geneva Academy team won the Prize for the Best Defence Memorandum. The academic track is designed to provide students with an interactive platform for academic research and critical debate. This track is addressed to students having an interest in pursuing academic research. The aim is to introduce students to the tools of academic research and to stimulate peer-discussions about complex theoretical issues within the field of transitional justice. The track combines introductory sessions on the aims and methodology of academic research with seminars where students present and discuss their master’s paper project. Moreover, the track includes an academic debate session allowing students to critically engage with controversial issues and questions and to take on the role of advocates or critics of particular strands of argument or positions. The programme was interdisciplinary. We not only heard legal perspectives about conflict resolution and dealing with the past but we also listened to talks from political scientists, artists, theologians, anthropologists or filmmakers.